"Pls help me draw as romantic as possible. Is important so that I can catch her heart! She like green and red colour. Hope the info can inspire ur imagination." Pen and brush inking on paper. Colouring (by hand) in Photoshop, as the smooth gradient sunset sky can be better achieved in this way than rendering with colour markers, which will have overlapping lines. 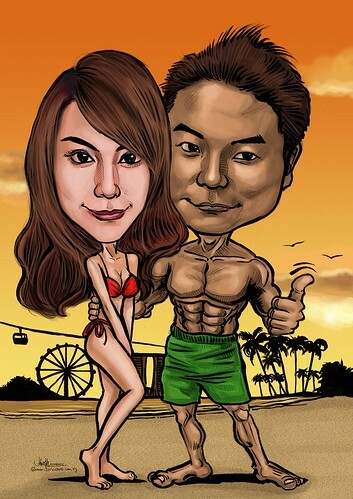 Do you consider this as traditional or digital caricature? I would say it's mixed medium!